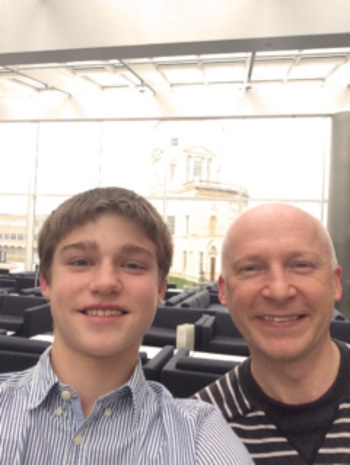 In this interview 17-year-old Jack Dry talks to Marcus du Sautoy, acclaimed mathematician and Simonyi Professor for the Public Understanding of Science at the University of Oxford, about football, cryptography, and numbers. Jack Dry (left) with Marcus du Sautoy. I will start with my most important question: are you Wenger-in or Wenger-out? I am absolutely pro-Wenger. He has brought an almost mathematical approach to football. This is something which is missing in football at the moment — there is so much data available which is not being used. For example, Wenger bought Mathieu Flamini because he did the research to see that Mathieu Flamini ran the most out of any midfielder in Europe during the year before he bought him, which is worth a lot on a football pitch. If you have watched the film Moneyball, it is clear how powerful statistics are in baseball, and I think football can learn from this. Do you think that statistics is more useful in baseball, which is a relatively static sport, than in football, such a fluid, dynamic, sport? Yes, there's definitely truth in that. Football is a dynamic problem — geometry in motion. If you are a player on the ball, what you need is a network of players providing as many outlets as possible. As players are frequently moving, and creating triangles, connections are frequently being created and destroyed — making it a dynamic network. This contrasts to the internet, for example, which is relatively static. I think Wenger knows about this. Is Arsenal's mathematical approach to the game partly why you decided to support them? Well, it is mainly because I live in London, next to Highbury, but I am certainly glad that they play like they do. Arsenal are a team which play with their brain — they play it like a game of chess. Sometimes too much, sometimes you just wished they would shoot! In addition to football, do you think that the public are oblivious to so much mathematics which underpins their day to day lives? Certainly. I [give lots of talks] about how powerful mathematical algorithms are behind the music which people love, for example. I think that the International Baccalaureate is much better at creating these connections between subjects than many other courses. Very often curriculums are isolated, you have mathematics, sciences, English and sport but people do not realise that there is so much fluidity between these. For instance, [the] theory of knowledge [course] encourages students to make these connections. Interestingly, I know that the guy who created the course was inspired by a lot of the things which I had written about these connections between subjects. The new book which I am writing, called What we cannot know, is all about limitations of knowledge. Are there problems in science which, by their nature, we will never know the answer to? For example, if the Universe is infinite, could we ever know that? Well, we already know that information can only travel at the speed of light which means that we are basically living in a bubble of knowledge and we cannot ever have access to anything outside this boundary. A powerful example of the mathematics behind our day to day lives can be found by looking at the internet. Whenever somebody makes a credit card transaction online, RSA cryptography is used to ensure that your credit card details do not get into the wrong hands. Exactly. RSA relies on the fact that multiplying two numbers together is very easy but finding their factors is extremely difficult, especially for 100 digit numbers. For example, if I told you to find the factors of 97507, a 5 digit number, just using pen and paper it would probably take at least half an hour. If I told you to multiply 281 by 347, it would probably take you a couple of minutes. If the Riemann hypothesis [a famous open maths problem, see here] is proved does that make RSA vulnerable? The statement of the Riemann hypothesis will not directly allow us to factorise numbers more quickly. However, it is likely that lots and lots of new mathematics about the primes will be created in proving it and some of this may be useful for factorising. For example, when Fermat's last theorem was proved, we learnt so much more about equations than that xn+yn=zn doesn't have any solutions for n>2. However, my feeling is that proving the Riemann Hypothesis will not make RSA vulnerable. I know that you have done a lot of work on Mersenne primes (prime numbers of the form 2p-1, where p is also prime). Do you think that there are infinitely many of them? Well my hunch is, at the moment, that there are only finitely many. I actually discovered that there is a connection between group theory, the study of symmetry, and the Mersenne primes. I know that if I can prove something about symmetrical objects then I could prove that there are infinitely many. I didn't expect to prove anything about Mersenne primes but one day I realised that my study of symmetry had implications for prime numbers. Mathematics is all about connections. Similarly, Riemann didn't expect to prove anything about primes, he was just interested in plugging complex numbers into the zeta function, but then he made a connection between the zeroes on the zeta landscape and the distribution of the primes. Marcus du Sautoy in his number 17 football shirt. I understand that your research primarily involves group theory. In schools we are often taught of the applications of calculus or probability for instance, but never symmetry. I was wondering whether you could tell me some of the applications of symmetry? Of course. The solutions to differential equations, for example, can be hugely simplified if you understand the symmetry at work behind them. A great example actually comes from physics. In the 1950s and 1960s, physicists discovered lots and lots of new particles but they didn't really understand what they were. They may as well have been biologists discovering species of butterfly! It was not until somebody discovered that a huge symmetrical object seemed to make sense of all of these smaller particles — it gave them structure. It is actually how we discovered quarks. Do you think that there are faults in the public's understanding of mathematics? Certainly. Too often you hear people calling multiplication or addition mathematics. It is not really about this. Mathematics is about finding patterns and stories. Remembering π to x amount of decimal places is nothing to do with mathematics. I get depressed when it is billed as a maths story when somebody has remembered π to thousands of decimal places. Who cares? Good Will Hunting or A Beautiful Mind? Fermat's Last Theorem or the Riemann Hypothesis? 17. As well as being my football shirt number, it is a Fermat prime, [a prime number of the form 2k+1, where K is a natural number]. We only know 5 of these! They have a very interesting property. Gauss proved that a regular polygon of n sides is constructible by ruler and compass if and only if n = 2mp1p2... pr where m is a natural number and p1, p2, ... pr are distinct Fermat primes. He managed to construct the 17-sided polygon as a kid. Coincidentally, masons also had to use the ruler and compass method which is why in church windows you often see octagons and pentagons but never heptagons, for instance. "God made the integers, all else is the work of man" — Leopold Kronecker It captures the universality of maths as well as the idea that maths is a human created subject. 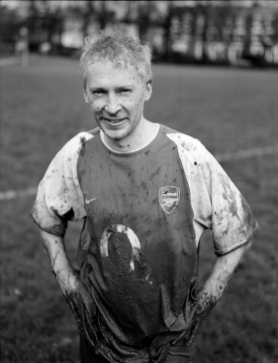 See all of Marcus du Sautoy's Plus articles here. See here to find out more about maths and football, and here to read more about maths and sport in general. The Plus article Safety in numbers explains RSA cryptography. Read more about the Riemann hypothesis and Fermat's last theorem and other number theory mysteries. Jack Dry is 17 years old and is currently in his first year of the International Baccalaureate. He goes to the Portsmouth Grammar School and loves playing football, golf and tennis in his free time and, more recently, has started to run around his local village.